Ben Affleck in The Town. If Gone Baby Gone (2007) made you sit up and take notice, then The Town just might inspire you to stand up and applaud. Academy Award winner Ben Affleck’s sophomore directorial effort does not disappoint. Affleck wore three hats for the movie: co-writer, director and lead actor. The Town, based on the book, “Prince of Thieves” by Carl Hogan, takes place in Charlestown, a neighborhood of Boston that is the armed robbery capital of the nation. It follows a group of four friends, native to Charlestown, who, being a product of their criminal environment and upbringing, have become adept at robbing banks, among other things. The opening scene of the movie is incredibly intense and very much expected from such a film. The action thriller is intertwined with a dangerous love story. 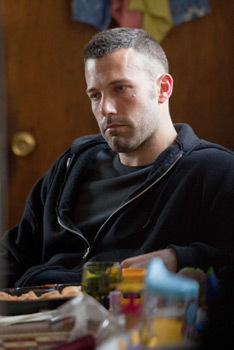 The leader of the group, Doug MacRay (Affleck), falls for a woman who he and his partners took hostage during a bank heist. As if this weren’t trouble enough, FBI Special Agent Adam Frawley (Golden Globe winner Jon Hamm of Mad Men) is hot on the trail of the four bank robbers. A unique and solid story line supported by a brilliant cast, including Oscar nominated Jeremy Renner (The Hurt Locker, 2008), make this a movie you will not want to miss. Doug’s intensifying relationship with the hostage, Claire Keesy (Golden Globe nominee Rebecca Hall), has a polarizing affect on his relationship with his long time brother-in-arms, Jem (Renner). Having already spent nine years in prison, Jem is a perpetual criminal who views Claire as a threat. A key element that gives this movie depth is the struggle that Doug faces in trying to make the transition away from his life of crime and his makeshift family to a fresh beginning, one that he hopes will include Claire. As he becomes more deeply involved with Claire, Doug tells her, “Some people get up every day and tell themselves they’re gonna’ change their lives and never do. I’m gonna’ change mine.” The odds are against him. He is a product of his environment, having learned his life of crime from his father, who’s “gotta’ die five times” before getting out of prison. His intent is all the more precarious since Claire is not aware that Doug is one of the masked men who robbed her bank at gun point and took her hostage, terrorizing her before setting her free. Oscar nominated Pete Postlethwaite (In the Name of the Father, 1993) is superbly cast as Fergie, the local drug lord and money launderer who is intent on throwing a wrench into Doug’s plan to break clean. It always amazes me when an actor can successfully direct himself in a movie, and Affleck is no exception. He gives a convincing and solid performance as the conflicted criminal in search of a better life. Renner gives a performance worthy of an Oscar nod, as he did in The Hurt Locker (2008). Jem is a character difficult to hold any sympathy for, but somehow, Renner manages to make us care. Hamm fit the bill nicely as the hard-nosed FBI agent looking to put a stop to this particular string of crimes. Helping him is local police detective Dino Ciampa (Titus Welliver, Lost), a “townie,” who grew up in the neighborhood with the very criminals he’s trying to put away. Hall (Vicki Cristina Barcelona, 2008) is convincing as the vulnerable victim, a Charlestown outsider, falling in love with someone she unwittingly knows so little about. Academy Award winner Chris Cooper (Adaptation, 2002), who plays Doug’s father, is only in one scene, but it is a powerful one in which he tells Doug a long overdue truth from the past. The most surprising performance came from Blake Lively, (Gossip Girl and Sisterhood of the Traveling Pants, 2005) who played Jem’s sister and Doug’s ex-girlfriend, Krista. Before seeing the movie, all I could imagine from Lively was a “peaches and cream” character. That image was shattered from her first moment on screen. She played Krista, a single mother, with just the right amount of toughness countered with desperation, as she yearns for Doug to love her. There is a bar scene, where Krista meets Frawley for the first time and it is particularly impressive. She and Hamm are riveting, and played very well off each other. The last thirty minutes of the movie will have you on the edge of your seat. The heist involves Fenway Park, or as Fergie put it, “taking down the Cathedral of Boston.” It is what action filmmaking should be: full of emotion, thrilling, suspenseful. The Town is a smart, emotional, roller coaster ride worthy of our attention. Ben Affleck has officially changed his profession from actor to actor/director and we should be happy for it.